You’ve come to the right place for a starter course on all about breeding canaries. There is more to it than most people realize but...on the other hand...it doesn't have to be difficult or time consuming. As a matter of fact...it can be downright enjoyable. Why breed canaries? Breeding canaries is a rewarding and possibly profitable past-time. 1. You can take your canaries to bird shows and compete for song, color, and composition. 3. Or you can just breed canaries for fun and enjoy their company and beautiful singing voices. 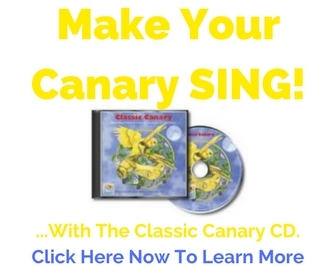 Click here...to learn more great reasons to breed canaries. Here is a quick primer on breeding canaries. this canary breeding cage is the best...click here. You'll of course need a nest for each pair. Two nests is better. Check out these canary nests. In nature, breeding season begins in the spring. Do you know that you can get an early start on the season by encouraging your canaries to breed in the dead of winter? It's obvious how a nutritious diet for your breeding canaries can lead to success. Here is what your canaries' diet should look like. If all goes well, in just a few weeks you'll have a few baby canaries poking there little heads out of the nest begging for food . Baby canaries need special care...click here. "Many thanks for your wonderful articles on canaries. My father died 2 years ago and I was left to look after his 3 canaries. Being a rookie I made many mistakes..."
Below is a short video that will let you see a working canary aviary. You'll see a hen feeding her babies, several stages of baby canary growth, and how young canaries are leg-banded. Just click on the PLAY button (the arrow pointing to the right... >). this... ||). The video will continue to download while you read the rest of this page. Then just click play again. The video is about 2 minutes 30 seconds. Breeding Canaries: First Time Canary Breeder. In your quest to learn about breeding canaries pay close attention to keeping each canary as healthy as possible. Return from All About Breeding Canaries to CanaryAdvisor.com Home.